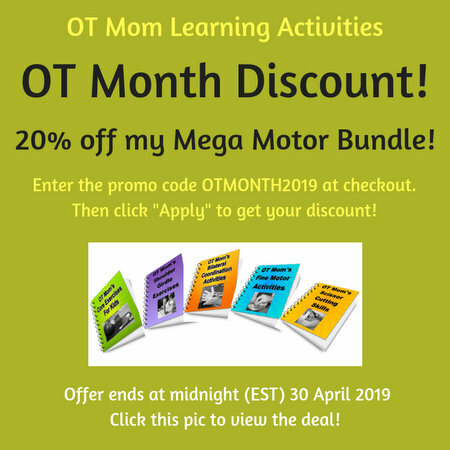 The author and publisher of the OT Mom E-books has prepared the e-books and the accompanying resources to the best of her abilities and with her best intentions. The information contained in the e-books is strictly for educational purposes. Therefore, if you wish to apply ideas contained in the e-books, you are taking full responsibility for your actions. None of the OT Mom E-Books serve as a substitute for an occupational therapy evaluation and treatment. Childhood disorders, learning disorders and developmental delays cannot be diagnosed or treated through the OT Mom E-books! Please contact your local Occupational Therapist if there are significant gaps in your child’s progress. If your child is currently attending Occupational Therapy, these e-book activities can be used to supplement what is being done there, but always check with your child’s Occupational Therapist first! As with all activities involving children, please take great care to ensure all sharp objects are moved out of reach, and that parental supervision is available at all times. Some activities suggested in the e-books make use of small objects that may cause a choking hazard for young children. Keep small objects out of reach of young children! Some of the activities require physical activity or exercise. Please only demonstrate these exercises if you are medically fit to do so. Your child should only carry out these activities if he/she is medically fit to do so. If in doubt, please consult your doctor. And if any activity causes any kind of pain and discomfort to you or your child, stop at once and consult your doctor. Every effort has been made to give accurate information and suggestions. Photographs have not been distorted or altered beyond routine editing for size and color. Most of the photographs were taken by an amateur photgrapher during real life activities with children, and are not of professional studio-style standards. The photographs on this website are the kind that are in the e-books. Results are entirely dependent on the persons demonstrating and taking part in the activities and games. The level of success attained depends on the time devoted to taking part in the activities and games, and the resources and skills of the persons taking part. Since these factors vary between individuals, we cannot guarantee success of individuals, nor are we responsible for any actions of any persons. The information provided in the OT Mom E-books is for general information purposes only and does not constitute professional advice on any subject matter. OT Mom Learning Activities does not accept any responsibility for any loss or injury which may arise from reliance on information contained on this site. The author and publisher of the OT Mom E-books and OT Mom Learning Activities shall in no event be held liable to any party for any direct, indirect, incidental or other consequential damages arising directly or indirectly from any use of this material. The e-books are provided "AS IS" without warranty of any kind, either express or implied, including, but not limited to, the implied warranties of merchantability, fitness for a particular purpose, or non-infringement.